The other day I saw some tile from China and it was the softest modern pink in all different sized square formats. I wanted it. I wanted it so much I looked to see where I could get it. Unfortunately that tile is not available on this continent. So where did I get my “pink” color fix? Surprisingly, at the Kitchen and Bath Show (KBIS 2019). 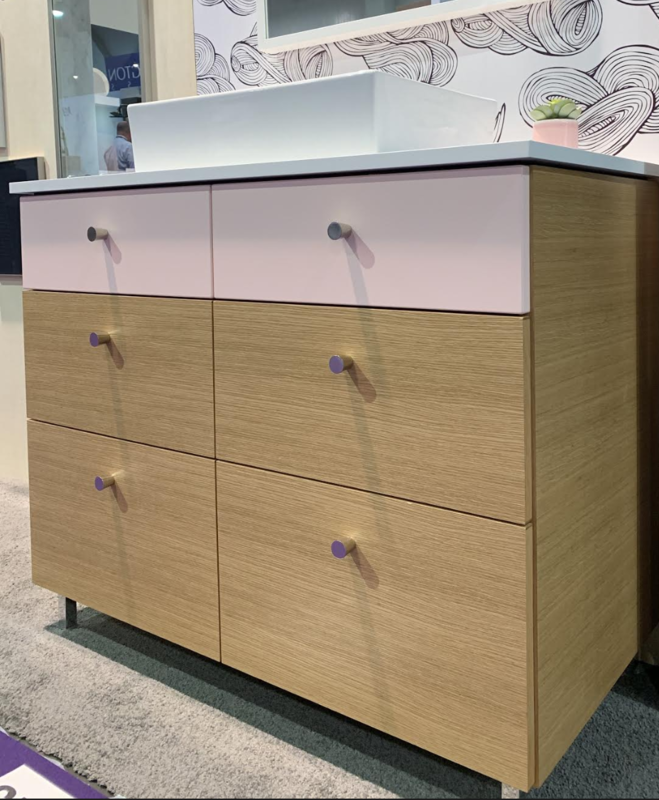 Held every year now in conjunction with the International Builder’s Show (IBS), KBIS is usually less color driven because of all the appliance and fixture manufacturers. Most of the popular products are white, black and stainless. This year there was a big change! There were several displays of muted pink, the so called “millennial neutral”. It did help that Pantone named their color of 2019 “Living Coral”. This is a brighter pink with a blend of tangerine. It has also helped that suddenly the desert, cactus and all the colors of pink sand became the lexicon of design. Anyone over the age of fifty will remember when bathrooms had pink ceramic tile with black accents. Well there’s a new twist on that midcentury style – soft pink with light wood accents in furniture. It’s all new and modern again with Northern Contours Blush SuperMatte and Rift White Oak veneers. Notice how the edge banding is seamless? That’s because they are factory banded. They offer a clear coat UV cured finish on the veneer components so it’s more environmentally friendly. Want to know more about Northern Contours? They are one of the largest contemporary door manufacturers in the U.S and Canada. To find out more, contact your local cabinet dealer or custom cabinet builder. What if you could have any color you wanted? Would you move away from stainless? Well that exactly what the market is yearning for – a change of stainless scenery. BlueStar offers more than 750 colors that can be color matched to any hue for the entire line of pro-style appliances. These appliances are not just colorful; they are performance driven with uncompromising durability and functionality. I heard about Blue Star years ago from a one of my gourmand friends so speaking about them as a design feature is fun, but they are seriously great pieces for the home chef. For more information, contact your local Blue Star dealer. I spied a pink color swatch at the Medallion Booth and had to check out all their new color ways. Some really rich blue tones and saturated green tones that I’d love to specify in a new project. 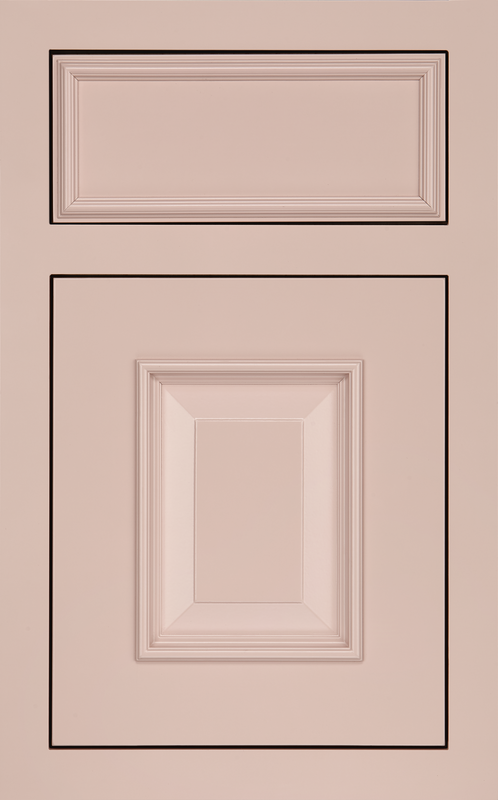 Medallion has a wonderful array of colors that are sophisticated and subtle including this new Blush pink color. What’s so great about adding a pop of pink to a kitchen, laundry or mudroom is that it connotes happiness, newness and birth or rebirth. A lighter pink that looks more like desert sand can be a neutral combined with white, black or gray. Pink continues to be a happy color and an extremely popular trend. For more information see your local Medallion Cabinetry dealer. Lixil’s Grohe Essence 30 Faucet available in over seven colors including white marble, black and gray. Ever see a pink faucet? Neither had I until I saw these colored Grohe Essence Semi-Pro faucets a few years ago. I loved them and thought that the yellow and green would be great sellers but pink and purple? No way. Well guess what? Today, pink is the hot color for accessories such as cabinet hardware, lighting, storage containers and yes, even faucets. Grohe offers the Essence faucets in seven colors plus black, white marble and gray. With so many to choose from you could swap the colored hose out every season with your decor. For more information see your local Grohe dealer.